MERCATOR -Tabula Cananae ae prout tempore Christi et Apostolorum divisa fuit. MERCATOR, G. / HONDIUS, J. - Tabula Cananae ae prout tempore Christi et Apostolorum divisa fuit. Tabula Cananae ae prout tempore Christi et Apostolorum divisa fuit. - MERCATOR, G. / HONDIUS, J. Title : Tabula Cananae ae prout tempore Christi et Apostolorum divisa fuit.. Size : 5.8 x 7.3 inches. / 14.8 x 18.5 cm. 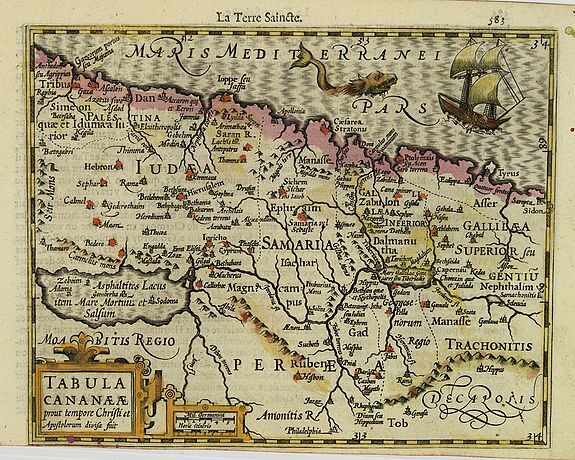 Description :Early map of the Holy Land, from the first French-text edition of Jodocus Hondius' Atlas Minor. Condition : Slightly age toning of paper. Lower margin short as issued. Else good condition.